This product requires the base game Krater. Krater is a game where a lot of work has been invested in the music. And the story how the main theme of the game music was created is a fascinating one. It all started when the Swedish musician Christian Gabel found a set of illustrations that seemed to be concept art for an abandoned film production. The artwork was dated 1982 and depicted scenes from his hometown Karlstad in post-apocalyptic ruins. In spite of research, no further information about the artwork, the artist or the (possible) movie has been found. The illustrations inspired Christian to start toying around with the idea of writing a 80's sounding film score for the concept art and the movie that was never made. 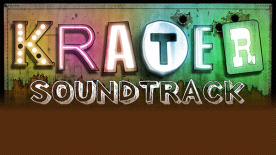 By a chance he and Fatshark met up and when discussing the music for the an old-school RPG in post-apocalyptic Sweden it was soon obvious for both parts that Christian should write the game music, based on the film score. You might have notice how in the game a visit to one of the many Solside bars ends up with you hearing a new song of Swedish indie (whether it is electronic, rock or pop) finest. Care to know which one is which on the soundtrack? Then this mix-tape of songs is for you as it contains a selection of the bar music as well as the main theme of the game. Requires Krater (base game) to use this DLC.